Here on homify 360°, we understand the importance of aesthetic value, whether it’s of a gorgeous patio, a striking living room couch, or simple window treatment. However, we also understand the importance of family, and how the arrival of little feet can change one’s life for the better. 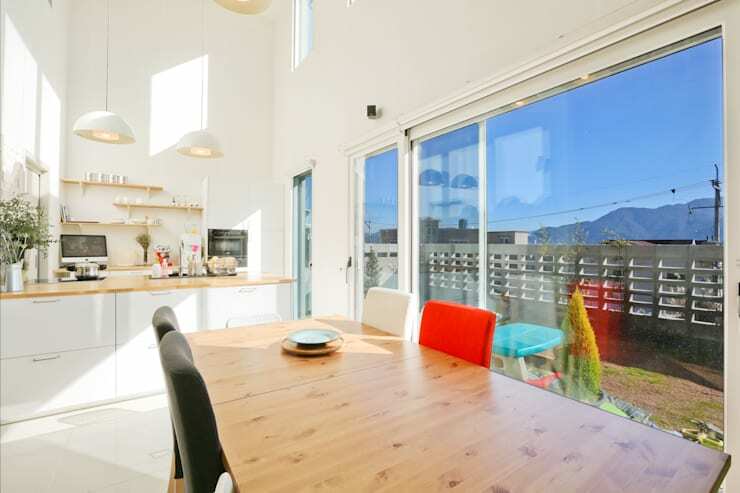 That is the topic of today’s architectural highlight: a family who, upon realising that their household was about to increase, decided to upgrade to a more family-friendly residence. 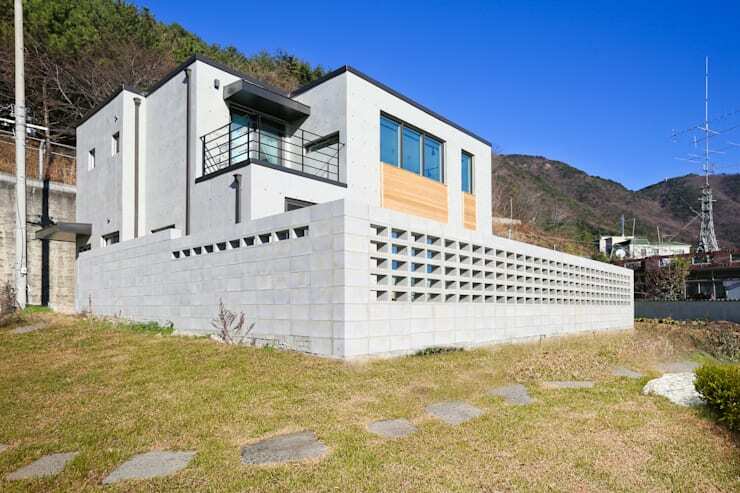 Korean architectural firm Hangul House Inc. was tasked with designing a family home that could comfortably cater for a family with two children, while still showing off strong values of style and beauty. The end result? A house that combines the modern design with family cosiness, flaunts striking and light-flooded rooms, and creates the perfect balance between structural beauty and family lifestyle. Flat roof. Square shapes. Linear designs. 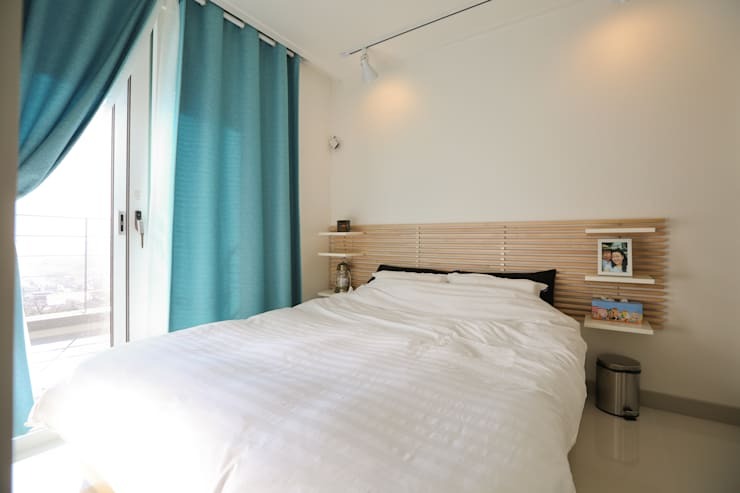 Those are just some of the typical characteristics of the modern style, and we on homify love it. Our architectural geniuses clearly know the style as well, as they made superb use of it in their creation. A cool and delightful blend of grey concrete and tanned timber make up the facade, resulting in a very stylish face for this family home. Shall we take a look at the insides? Is this not the ultimate area for the loving family that consists of devoted parents and busy youngsters? We love how the modern designs play together with the colourful and fun elements that betray this is a place inhabited by little ones. The dining room, which shares an open-floor plan with the living room and kitchen, is located on the ground floor. Thanks to generous-sized windows and glass doors, as well as a crisp white palette that adorns the walls, the interiors positively glow with reflecting light and charming vibes. Whether it’s in a bachelor pad or a family home, the kitchen has a very important role to fulfil. As the heart of the home, it must present a comfortable and welcoming vibe, as well as be exceptionally functional and practical. 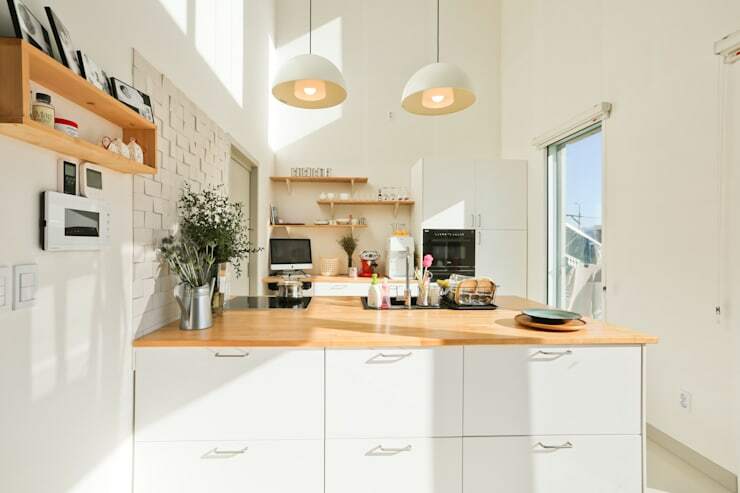 No problem here, then, as this open-plan kitchen lovingly invites us to sit down for a chat, or lend a hand with the cooking. Snow-white surfaces contrast beautifully with the sandy wooden areas, ensuring warm and natural touches in this culinary space. Notice the brick surface that adorns a select portion of wall attached to the peninsula; it might be in the same calm white as the walls, but it adds a delightful touch of pattern to the kitchen. The top floor is where all the bedrooms are located, sharing direct access to the balcony. Taking a tip from the kitchen, the main bedroom (seen here) opted for big and bright windows to a allow decadent dose of sunlight inside. Neutral colours work a treat in boosting visual space, but there is no need to go about it in a bland and boring manner. Notice the striking headboard flaunting a bit of Asian persuasion with that linear timber design. And the window treatment in a parade blue ensures a touch of freshness and serenity in this bedroom. Little space calls for big ideas, and our architects answered the call. 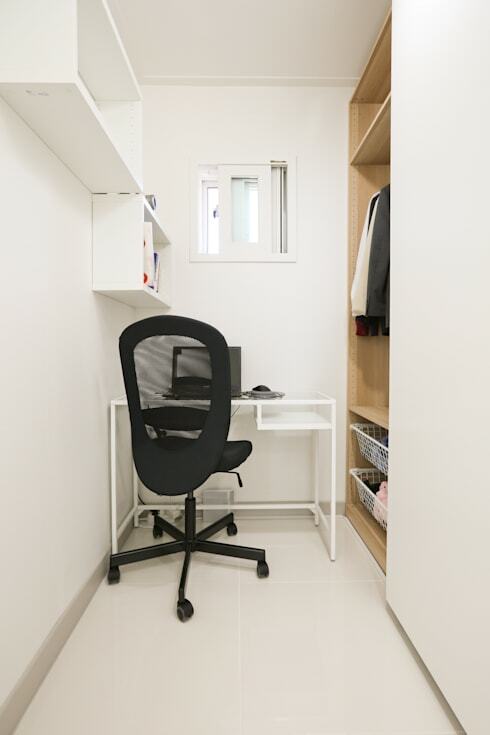 They have converted the slim room next to the bedroom into a double-duty space, serving as both a dressing room and home office. By designing the majority of surfaces in white and opting for a minimalist approach in terms of décor, the space really does look bigger than it actually is. They’re all doing it, so why not you too? See how to: Style Your Home Like A Scandinavian. White surfaces and timber add-ons are clearly a successful duo, which is why it was used in the bathroom as well. Throw in the use of smart and simple linear designs and you have a home that makes optimum use of its limited legroom. 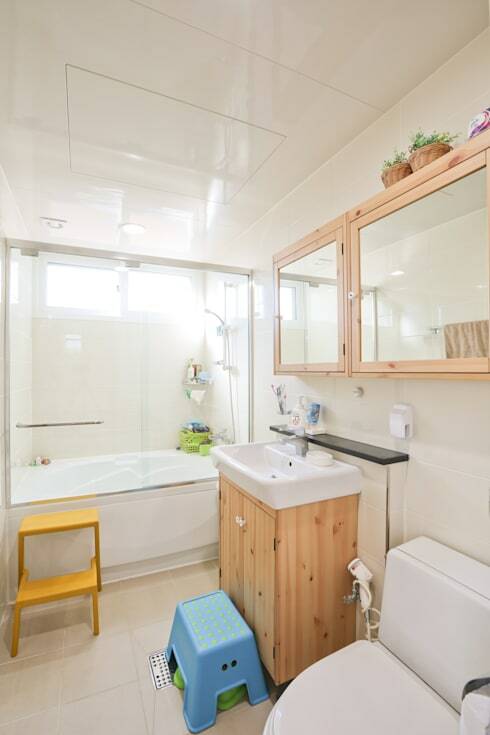 But don’t overlook the additional tips in this bathroom that also helps squeeze out even more space: the small window is big enough to ensure natural lighting yet small enough not to impose on the bathroom, while the shower-and-bath-in-one effectively takes care of two birds with one stone.